Southend United manager Phil Brown insists the Shrimpers' play-off ambitions are realistic with seven league games remaining. After Wednesday's win over Sheffield United, Brown's side are just six points outside the top six. "If we carry on like this, with seven games to go we might get enough points to get into the play offs," the 56-year-old told BBC Essex. "It's not rocket science," he continued. "It's simple mathematics." 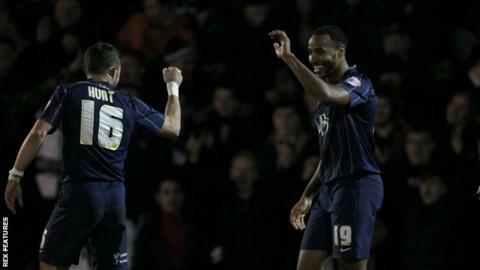 The victory over the Blades moved Southend, who won promotion from League Two last season, up to eighth in the table and was the perfect response to their defeat at Rochdale on Good Friday. "It's a landmark victory for me because Sheffield United's a big club," Brown continued. "They have lot of history, a lot of tradition and we've put them to bed. "I've only thrown this system at the players two days ago and every credit to them, they've grabbed hold of everything we've told them. "We've a lot to play for and there's a lot of pressure on, but I am not taking my foot off the gas yet."